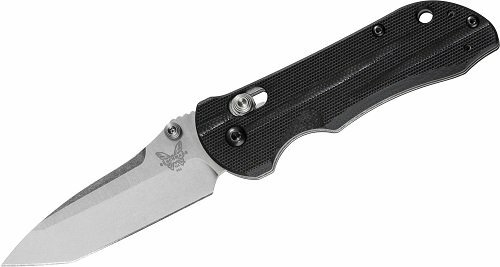 The AXIS Stryker are part of a long family heritage of knives in the Benchmade line that stretches across auto, assist and now manual. Slim tractable handles and multiple options for size and blade style make this a great choice for a tactical daily duty knife. –SPECS: Designer: Benchmade | Mechanism: AXIS | Action: Manual-opening | Blade Steel: 154CM (58-61 HRC) | Blade Length: 3.57" (9.07cm) [908/909] or 2.94" (7.47cm) [903/904] | Blade Thickness: 0.124" (3.15mm) [908/909] or 0.104" (2.64mm) [903/904] | Open Length: 8.29" (21.06cm) [908/909] or 6.81" (17.30cm) [903/904] | Closed Length: 4.72" (11.99cm) [908/909] or 3.87" (9.83cm) [903/904] | Handle Thickness: 0.47" (11.94mm) [908/909] or 0.40" (10.16mm) [903/904] | Weight: 4.38oz. (124.17g) [908/909] or 2.84oz. (80.51g) [903/904].— Intended for Tactical or Everyday use, the AXIS Stryker family offers multiple options of size and blade styles. The AXIS Stryker family [908/909/903/904] have a reversible tip-up deep-carry pocket clip.